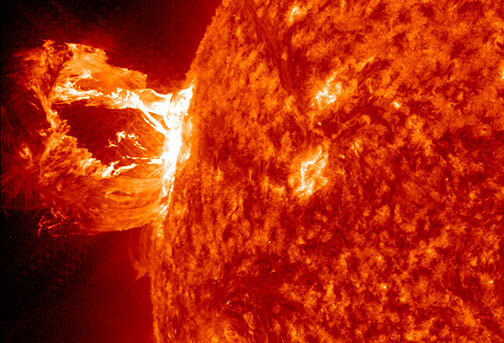 (Nanowerk News) When a solar flare filled with charged particles erupts from the sun, its magnetic fields sometime break a widely accepted rule of physics. The flux-freezing theorem dictates that the magnetic lines of force should flow away in lock-step with the particles, whole and unbroken. Instead, the lines sometimes break apart and quickly reconnect in a way that has mystified astrophysicists. But in a paper published in the May 23 issue of the journal Nature ("Flux-freezing breakdown in high-conductivity magnetohydrodynamic turbulence"), an interdisciplinary research team led by a Johns Hopkins mathematical physicist says it has found a key to the mystery. The culprit, the group proposed, is turbulence—the same sort of violent disorder that can jostle a passenger jet when it occurs in the atmosphere. Using complex computer modeling to mimic what happens to magnetic fields when they encounter turbulence within a solar flare, the researchers built their case, explaining why the usual rule did not apply.